Reigning champions Saracens thumped Leicester Tigers 44-17 at Allianz Park to book a second consecutive Aviva Premiership final at Twickenham. Saracens were crowned European Champions last week and their performance in knocking Leicester out of the Premiership title race shows they are the dominant team in the Northern Hemisphere. Saracens will play the winner of the second Semi-final which is Exeter Chiefs against Wasps. Leicester Tigers almost scored from the start but it was Saracens who got on the scoreboard first and they went on to outscore Leicester 31-0 in the opening half. Chris Ashton was named Aviva Premiership man of the match but Saracens could be without Owen Farrell for the final as he sustained a rib injury in the match and Saracens are awaiting results on the extent of the injury. Will Fraser, Chris Wyles (2) and Chris Ashton (2) were the home team’s scorers while Telusa Veainu and Dom Barrow crossed for Leicester. The Midlands outfit suffered a further blow in the first-half when Manu Tuilagi came off injured and, without the centre on the field, the visitors struggled to gain any forward momentum. However, that changed in the early part of the second 40 minutes as touchdowns from Veainu and Barrow brought the Welford Road side back into contention. But Mark McCall’s men managed to re-find their composure as Ashton’s second score and successive Charlie Hodgson three-pointers took them into the showpiece event. 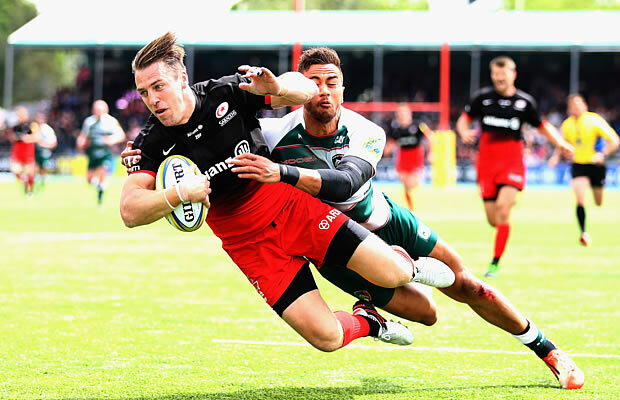 Leicester went into the encounter hoping that Saracens’ European excursions would see them lose focus, but the first five minutes merely dispelled that notion. Although the Tigers had a try ruled out early on after a Barrow indiscretion, McCall’s side were simply too powerful and clinical. That was expertly demonstrated by Schalk Brits and George Kruis, who combined to send Fraser charging across the whitewash, before a poor Owen Williams kick was pounced on by Wyles. 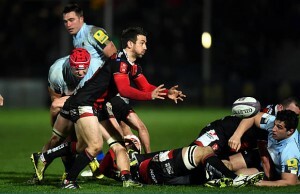 The winger showed good awareness and speed to evade two attempted tackles and take Sarries 14-0 in front. With the wind against them, Richard Cockerill’s team were struggling to get out of their own half and the hosts capitalised on the territorial dominance. A brilliant team try, which was instigated by Billy Vunipola, resulted in Ashton surging free down the right touchline. Owen Farrell superbly added his third conversion of the afternoon and also scored a penalty as the buffer became a seemingly insurmountable 24 points. Wyles’ intercept score on the stroke of half-time appeared to put the result beyond doubt but the Tigers opened the second period with intensity. 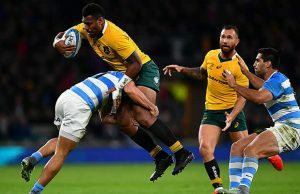 A Williams break resulted in Veainu touching down before the fly-half kicked a three-pointer to reduce the arrears to 31-10. Fraser was then yellow carded and Barrow went over in the following passage of play as Leicester increased the pressure. All of a sudden, Saracens were looking slightly perturbed but they regained their momentum and a pair of Hodgson penalties, who was on for the injured Farrell, re-established their authority on proceedings. With their place in the final now secured, Sarries managed to have the final word when good work from Maro Itoje allowed Ashton to score his second of the match. Referee :JP Doyle (115th Premiership game). Assistant Referees: Craig Maxwell-Keys & Paul Dix.